Meningococcal disease is the leading infectious cause of death in early childhood,3 and its control has been a public health priority for decades. In the UK, most cases have been caused by MenB and MenC, with small numbers caused by MenW and MenY; other capsular groups are rare (figure 1). During the 1990s, a rapid rise in cases caused by a single MenC clone led to the introduction of the National Health Service (NHS) MenC vaccination programme in 1999, which successfully controlled the outbreak and has sustained population protection against MenC over the past 15 years; it is now apparent that the success of this programme depends largely on indirect (herd) protection.4 Meningococci are carried in the nasopharynx of healthy individuals, particularly adolescents and young adults, and only cause disease when transmitted to susceptible individuals. MenC vaccines are made by chemical conjugation of the surface capsular polysaccharide to a carrier protein—such as tetanus toxoid or a mutant diphtheria toxoid (CRM197)—making a highly immunogenic construct. MenC conjugate vaccines provide individual protection against MenC disease and prevent acquisition of colonisation in the nasopharynx, thereby interrupting transmission of MenC so that the wider population is protected. Adjustments to the MenC programme in recent years have focused on enhancing immunity among teenagers to prevent colonisation and thus enhance indirect population protection as carriage of meningococci is highest among adolescents. 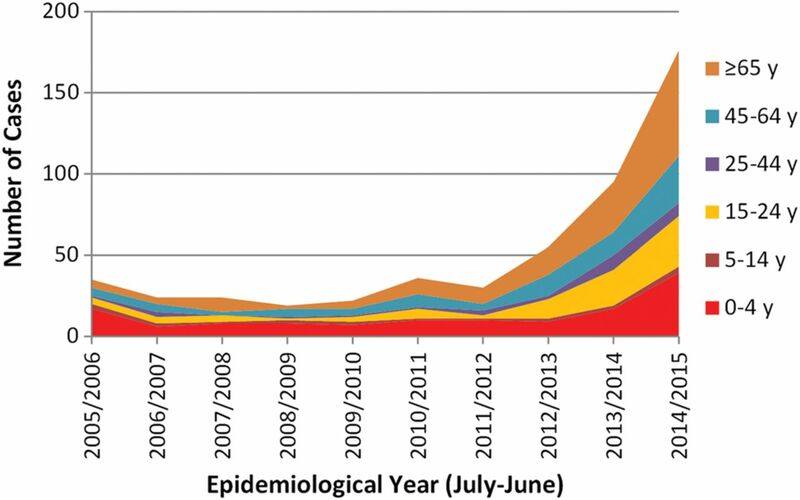 Laboratory-confirmed cases of invasive meningococcal disease in England by capsular group and epidemiological year. The blue arrow denotes the start of the national immunisation programme against group C meningococcal (MenC) disease. Source: Public Health England. Since the success of the MenC conjugate vaccination programme, MenB has been responsible for almost all cases of invasive meningococcal disease in the UK, especially in children and young adults. 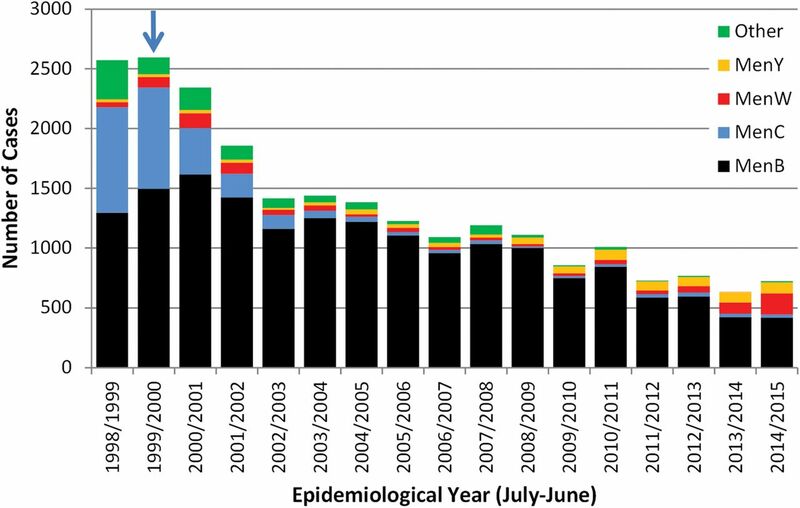 In England, as in the rest of Europe, MenB cases have been declining across all age groups: from 1614 cases in the 2000/2001 epidemiological year (July 2000 to June 2001) to 418 cases in 2014/2015 (figure 1). This decline is most likely due to natural secular trends and MenB cases are expected to increase again at some point in the future (as seen with MenB and MenC in the mid-1990s), due to, for example, the introduction of a new MenB strain into the population. The burden of meningococcal disease is greatest in young children with half the cases currently diagnosed in those less than5 years of age. Infants (<1 year-old) have the highest number of cases and deaths due to MenB.5 After the 1st year of life, cases decline with age until adolescence where a smaller peak is observed (figure 2). Age distribution of laboratory-confirmed invasive meningococcal cases by capsular group in children and young adults over the past 10 years (England, 2004/2005 to 2014/2015). This much anticipated and ground-breaking programme commenced in autumn 2015, with a three-dose schedule of 4CMenB to be offered as part of the primary immunisation schedule at 2 months, 4 months and 12 months of age. When 4CMenB is administered with other routine infant immunisations, fever occurs in 51–61% of infants.12 Despite previous advice that paracetamol might interfere with the immune response to infant vaccines, a recent clinical trial showed that prophylactic paracetamol significantly reduces the rate and intensity of fever after vaccination with 4CMenB, without affecting the immune responses to any of the infant vaccines.13 Consequently, parents will be advised to give three doses of paracetamol when their infants receive 4CMenB as part of the infant schedule, with the first dose given with or as soon as possible after vaccination. Paediatricians should be aware that, in clinical trials, some postvaccination fevers resulted in attendance at medical facilities. A careful history of recent vaccination should be elicited; fever due to vaccination peaks at around 6 h and is unlikely to persist beyond 48 h. As with all fevers in infants, the potential for serious bacterial infection should be considered, even when temporally related to the vaccine. Like MenC, 4CMenB was licensed on the basis of immunogenicity, although the OMV component has been shown to be efficacious against matching strains in New Zealand. A specific laboratory assay known as Meningococcal Antigen Typing System was developed as proxy for the existing correlate of protection, and this was used to predict the proportion of invasive MenB disease that might be preventable by 4CMenB.8 Consequently, there remains uncertainty about the precise level, breadth and duration of protection that will be induced by the new programme. The MenB implementation will be closely monitored by Public Health England with detailed follow-up of all laboratory-confirmed cases in children younger than 5 years. Acute and convalescent sera will be requested to assess immune responses to meningococcal disease in vaccinated and unvaccinated children. At the same time, meningococcal isolates and PCR-positive clinical samples will undergo genetic and molecular testing to determine whether or not they were potentially preventable by 4CMenB. The UK is, therefore, likely to be the first country to be able to determine vaccine effectiveness in the field. A detailed Public Health England surveillance plan for England is available online.1 The programme will be reviewed by JCVI and it is expected that the first reliable indications will become available around 2 years after implementation. The infant programme is expected to provide direct protection for vaccinated children but will provide limited indirect (herd) protection as infants are not thought primarily responsible for carriage and transmission of meningococci. Further work is being undertaken to assess the potential for an adolescent MenB programme that, like the MenC immunisation programme, might induce direct and indirect protection, but requires large-scale carriage studies and several years to gather the information required to support such a programme. Until recently in the UK, MenW has been a rare cause of meningococcal disease, accounting for less than 5% of all cases across all age groups.5 In the early 2000s, an international outbreak of MenW disease associated with pilgrimage to the Hajj was terminated by the introduction of mandatory MenACWY vaccination for all pilgrims.16 Since 2009, however, there has been a year-on-year increase in the number of MenW cases in England, from 19 in the 2008/2009 epidemiological year to 176 in 2014/2015, accounting for a quarter of all laboratory-confirmed meningococcal cases in that year (figure 3). The emergent MenW strain belongs to the highly virulent ST-11 clonal complex that was responsible for the UK MenC outbreak in the 1990s and is genetically identical to MenW strains currently causing large national outbreaks in South America.2 In England, MenW cases are being diagnosed across all regions and all age groups. Most MenW cases are diagnosed in previously healthy individuals who have not travelled abroad, indicating that this strain is now established as endemic, and who may develop severe clinical disease often requiring intensive care support. Moreover, the clinical presentation has sometimes been atypical, with septic arthritis and severe respiratory tract infections (including pneumonia, epiglottitis and supraglottitis) being over-represented among MenW cases compared with other meningococcal groups. Several adolescents and young adults with MenW septicaemia presented primarily with gastrointestinal symptoms and progressed rapidly to death without having the characteristic non-blanching rash. A consequence of such atypical presentations is that meningococcal disease is not considered in the differential diagnosis until a positive culture becomes available, potentially leading to delays in diagnosis, offering chemoprophylaxis to close contacts and identifying clusters and local outbreaks. Laboratory-confirmed cases of invasive meningococcal group W (MenW) disease by age group and epidemiological year in England. Fortunately an effective vaccine for MenW already exists as part of multicomponent conjugate vaccines that also protect against group A, C, W and Y meningococci (MenACWY). Like the MenC conjugates, these vaccines contain the capsular polysaccharides of these four meningococcal capsular groups chemically conjugated to tetanus toxoid, CRM197 or diphtheria toxoid (diphtheria toxoid conjugate only available in the USA). In February 2015, the Department of Health accepted JCVI's advice that the vaccine should be used to control the rapid increase in the number of MenW cases. From 1st August 2015, the MenACWY conjugate vaccine will be offered to adolescents aged 14–18 years because this age group experiences a high attack rate, and, as with MenC, teenagers and young adults have the highest carriage rates and are considered to be responsible for driving transmission.19 The JCVI considered it highly likely that vaccinating individuals in this age group will result in wide population protection and eventual control of MenW. Because the MenACWY conjugate vaccine also protects against MenC disease, it will replace the MenC conjugate vaccine currently in the routine adolescent programme from late 2015 to maintain long-term population control of MenC. Replace MenC with MenACWY vaccination in the existing time-limited ‘freshers’ programme (ie, for older first-time university entrants who have not already received MenACWY through school year 13) through general practice. Replace MenC with MenACWY vaccination in the routine adolescent schools programme (school year 9 or 10) from autumn 2015. Include a catch-up campaign for current school year 10 students through schools from January 2016. Plan subsequent catch-up campaigns to cover the current school years 11 and 12 when these students reach year 13. Summary of the adolescent groups A, C, W and Y meningococci (MenACWY) conjugate vaccination programme in (A) areas that currently offer the group C meningococcal (MenC) conjugate vaccine to school year 9 and (B) that currently offer the MenC conjugate vaccine to school year 10 while working towards a transition to a year 9 meningococcal vaccination programme in 2016/2017. The introduction of the MenB vaccine for infants may also provide some protection against MenW, since one of the components of 4CMenB vaccine (neisserial adhesion A, NadA) is found on the surface of the emergent MenW ST-11 clonal complex (unpublished observations). The MenB programme may, therefore, provide some protection for infants and toddlers until population control is established through the herd protection engendered by the adolescent programme. Currently, the MenC conjugate vaccination programme consists of a dose at 3 months, 12 months (in a Haemophilus influenzae type b/MenC combination) and 13–14 years of age. Once the MenACWY programme and MenB programmes are fully established, it may be possible to drop the infant dose at 3 months because MenC disease is rare in infants, the adolescent MenACWY programme will maintain herd protection for the population and the infant MenB programme may also offer some protection against other meningococcal capsular groups, including MenC. The current programme with these recent changes can be found here: (https://www.gov.uk/government/uploads/system/uploads/attachment_data/file/465880/9406_PHE_2015_Routine_Childhood_Immunisation_Schedule_12.pdf). Because of the established enhanced national surveillance in place to monitor the MenC programme over the past two decades, the UK is in a unique position to evaluate the impact of both new programmes. The implementation of a comprehensive programme against capsular groups A, B, C, W and Y meningococci is a huge step forward for child health in the UK. While the full extent will not be known for several years, these programmes have the potential to have a major impact on the incidence of meningococcal disease across the whole population.
. Genomic resolution of an aggressive, widespread, diverse and expanding meningococcal serogroup B, C and W lineage. J Infect 2015;71:54452. Contributors All of the authors contributed equally to the development and final review of the manuscript. Competing interests AJP is Chair of the Department of Health's Joint Committee on Vaccination and Immunisation. AJP has previously conducted research on meningococcal vaccines on behalf of the University of Oxford funded by vaccine manufacturers but no longer does so, and has not received any personal payments from manufacturers. RB performs contract research on behalf of Public Health England for GSK, Novartis, Pfizer and Sanofi Pasteur but receives no personal remuneration. SNL performs contract research on behalf of Public Health England and St. George's University of London for vaccine manufacturers but receives no personal remuneration. JMW is the deputy chief medical officer at the Department of Health.